New signing Chu-Young Park will be in doubt for this Satuday’s clash with Premier League new boys Swansea as he waits for his visa in Paris. The former Monaco player was one of four late signings for Arsenal, who swooped on him just before he could wrap-up transfer dealings with Lille. 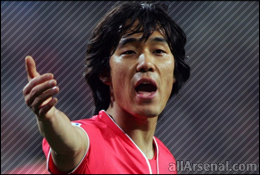 Park has been in hot form for his country netting four times in the international break which consisted of a hat-trick against Lebanon and a well finished goal against Kuwait. We have an uncertainty still with the visa of Park. He is in Paris at the moment, but we hope it will be sorted out tonight. He has been away playing against Lebanon and Kuwait. From Kuwait he has flown directly to Paris and should come back tonight. From what I have seen of Park he looks a good solid player, although with Walcott returning to full fitness will be unlikely to make a start in this Saturday’s match. I expect him to come off the bench though if he secures his visa and hopefully he puts in a good performance!